To participate in society, migrants must be language proficient. In learning the language of their new home country, they are often supported by local volunteers. The VIME project has provided better understanding of the roles of these language volunteers and offers practical guides and insights. As Dutch project partner, we gladly offer support on implementing the VIME tools to any organization wishing to improve the quality of the language education support provided by volunteers. 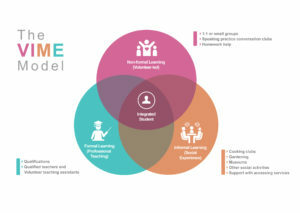 As VIME project partner, we can support you in using the model, guides and tools as provided on the website languagevolunteers.com in your local situation. In addition, we would happily discuss with you the applicability of other tools and methods we have developed based on more than 40 years of Dutch experience with language volunteers. Please contact Sylvia de Groot Heupner, Director to talk about your specific needs and opportunities regarding volunteers in migrant language education.